Can someone post MicroSD cards here that work? I tried a 32gb card I already had and I get the -84/-110 error. I purchased a class 4 32gb card because I read somewhere that it can only handle 4mb/s class 4, and I get the same error. I ran a speed test on the new card and even tho its class4 it is read/write 20mb/s. I have not been able to find a single MicroSD card that works. I have ordered and returned multiple cards from amazon now. As of right now this is useless. Can this block be used in order to extend the internal 4GB of space for programs? 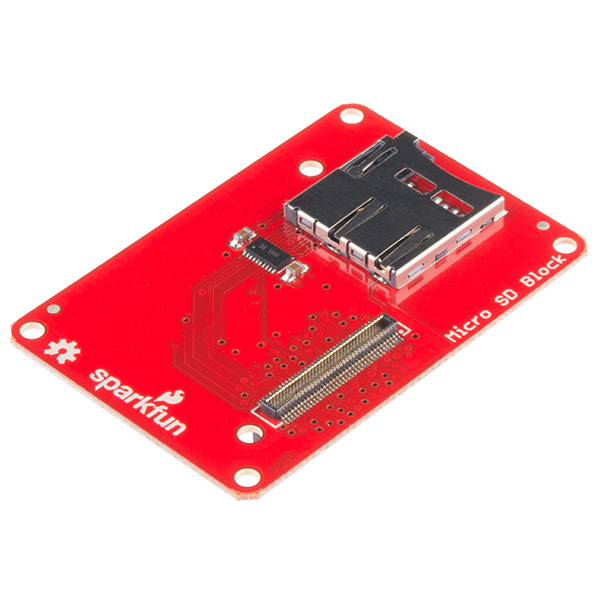 I've attached this block with the base one, and it is not possible to insert an SD card into the slot when a USB cable is connected. As I wrote in another comment, I've bought an assortment of blocks for professional research works involving IoT stuff, and although they are quite attractive at first (and on the pictures) they prove to have too many design flaws for being really adopted for use cases other that basic ones. I hope that Sparkfun (which is one of my favourite providers for the kind of products they sell) will come soon with redesigned versions of these blocks, taking in account a couple of mechanical issues (another customer mentioned to problem of bolts been too close to some components, there is also the problem of the battery being shorted by the USB socket of the base block if you overlook to put an insulation first,...). This seems flaky at best with Class10. Both Patriot and Samsung Class 10 fail on multiple boards and multiple cards. I had to resort to buying a Class 6 SD card and who know how much longer we will be able to source them. Are there any plans to update this board? Presumably the speed of the level translator is to blame. I am trying to use this with the "base" block. It does not auto-mount as it says in the hookup guide and I don't even know the correct device to manually mount. I am using the latest Edison image, unaltered. I have verified that the microSD (Samsung EVO, 32 Gb) is good. Any hints would be appreciated. I just tried a class 4 32 Gb card (Sandisk) and it works fine and automounts as it's supposed to. I still don't know why the the Samsung class 10 card does not work, but at least I have a working card now. Probably due to the error above /dev/mmc1* does not exist. I wish that I new where to find the meaning of error -110. I get 'mmc1: error -84 whilst initialising SD card' but can still manually mount it. Did you try manually mounting the card as per my commands below? I have had some success. 'dmesg -T | grep mmc1' showed that it was detecting the SD card at least on mmcblk1. The following commands allowed me to mount the the Kingston SD card on /mnt/mmc. This was strange as it wouldn't work if I specified the partition i.e /dev/mmcblk1p1 as suggested. I am trying to do exactly the same thing, but I am using Ubilinux. I have tried a Sandisk 16GB Ultra SDHC, and a Kingston 4GB SDHC. Both do not mount automatically and 'df -h' does not show any drives. Any suggestions SF? 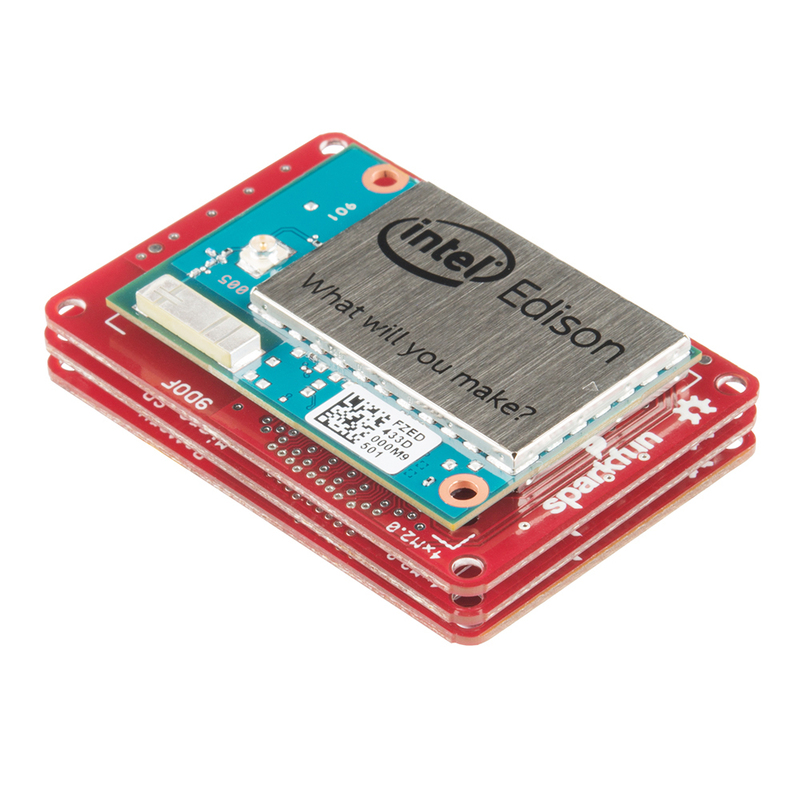 Can this be stacked between the Edison SoM and the Intel mini breakout board? 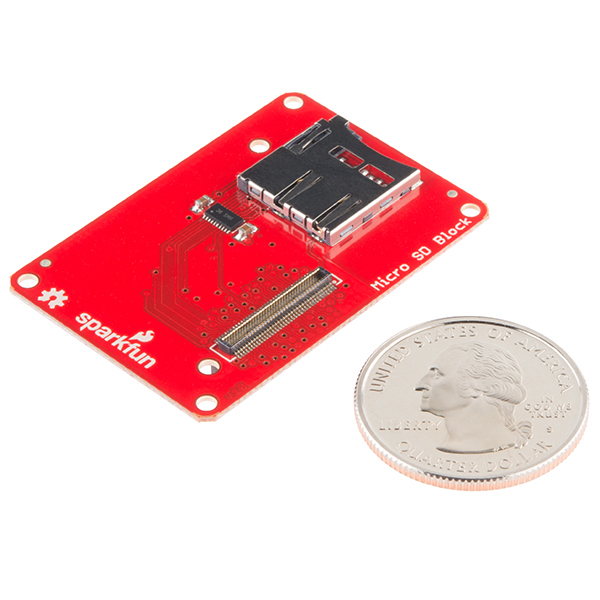 Or only Sparkfun's own breakouts? I managed to get this to work on the mini breakout, but I had to desolder the headers for the battery and thermistor, and desolder the power button. The application I'm using it in needs the battery, so I soldered a JST on the other side of the board and shorted the thermistor pads (for 190mA charge rate). The ground pads on both of these aren't thermals, so I had to bring it to work to hit it with a meatier iron than my station at home to get these out cleanly. I also wound up having to buy 4mm M2 screws since the ones included in the SF hardware kit are too short to fit through the breakout. I also took the opportunity to solder this DC barrel jack to the pads at the other end of the board, which works fine for the pile of 2A 12V adapters I have in my junk box. Will this support UHS-1 cards (very fast microSD cards)? Did you find out the answer to this? I'm trying to get my SD card block working, but it's not mounting in Ubilinux. I'll have to try find a standard card. 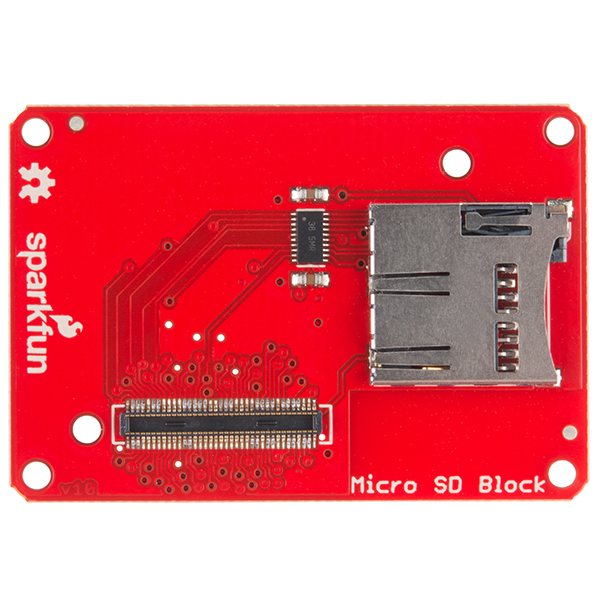 Can we see the "bottom" of the SparkFun blocks for Edison? I can't figure out which boards stack and which ones won't. When all the pictures were taken the only boards that did not have connectors on both sides were the battery and the OLED screen (you don't want that one in the middle of a stack anyway). But the designs are not finalized yet. Once they are finalized there should be more information as well as pictures available. Excellent. I look forward to making a stack. Thanks! The schematics and Eagle files for these will be up when we've actually finished the design. Right now our Blocks are all in functioning prototype stage meaning they will probably get a few tweaks. 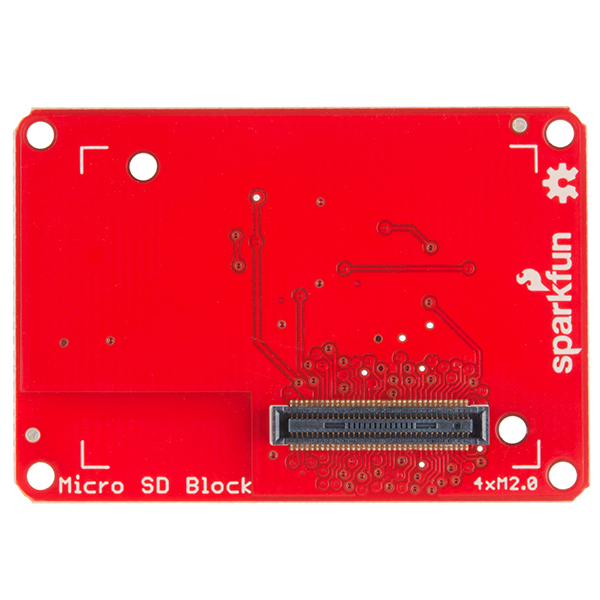 If you'd still like to see the files email techsupport@sparkfun.com, I don't know the state of the files but they might be able to get the current files for you. And doesn't need any configuration. Just plug it in, add an SD card, and your new filesystem is mounted for you. Block is appropriately sized and easy to install. A design flaw I've noticed is that when combined with the Raspberry Pi header extension the USB power cable blocks this port from being used. I only have one spare micro sd card around and it gives the above error. Installation is a snap though. Literally! Both the snap of the head connector and the micro sd card into this unit are very satisfying.